Members of the SUNY New Paltz community came together beneath the flag poles outside Haggerty Administration Building for a Memorial Day ceremony honoring those American military personnel who have given their lives in service of their country. 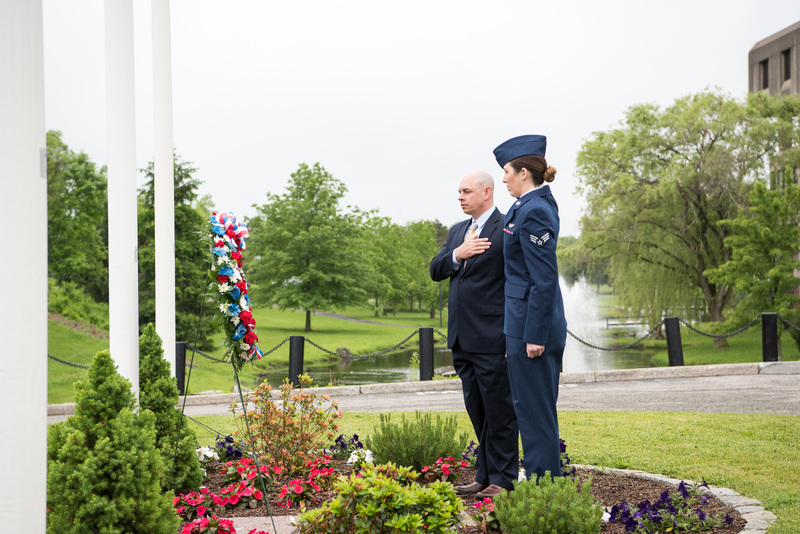 This was the third annual wreath-laying ceremony convened by the College’s Office of Veteran & Military Services (OVMS). The Office is dedicated to supporting military-affiliated students who attend New Paltz, but on this occasion OVMS Coordinator Jason Gilliland lead members of the faculty and staff in paying tribute to those who sacrificed their dreams and ambitions for a cause greater than themselves. “Our campus community will always be proud of the selfless service of the more than one million men and women who have made the supreme sacrifice for the United States since our nation’s founding,” Gilliland said. New Paltz alumna and Air National Guardsman Senior Airman Sinead Kirnan ’17 (Biology) presented keynote remarks before joining Gilliland in laying the ceremonial wreath. « College mourns the passing of UPD Lt. Norman Phillip Rider, Sr.